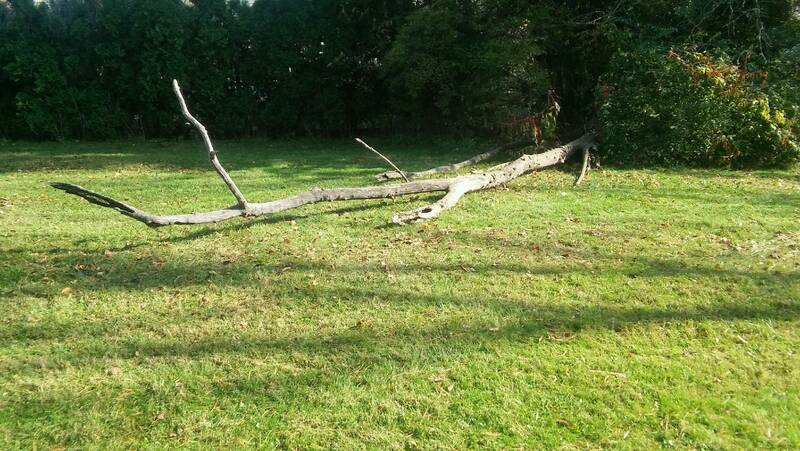 A dead tree fell over in our neighbor’s backyard, during a storm the night before Halloween, this past fall. I took this picture a few days later. It’s still there. The title of this post is ridiculous on a personal level: if there is one thing I have been doing less of since my last post – 31 months ago! – sleeping is that thing. For the purposes of this blog and blogging in general, however, it is appropriate for the moment. I want to begin blogging again, and perhaps this post is my new beginning in that sense. What I don’t know is whether I will continue to blog here at Dischordant Forms or elsewhere. I’m less fond of the name than I was several years ago when I started the blog, and I also feel separated – by time, circumstance, and perspective – from the writing I did then. I am not entirely out of practice, mind you. I have had another blog for several years, and while that one is also currently neglected, I’ve continued to post there irregularly (and as recently as this past summer). Additionally, over the past several seasons I have pounded out more than a handful of unfinished drafts for this place. Dissatisfaction, for one reason or another, has consigned those posts to purgatory. What do I want out of my blog? I want to write. I want to have a modicum of discipline about it. I want to have the satisfaction that comes from building a body of thoughts and expressions that I can refer back to. I’m a person who likes to put boundaries around certain things that I do. Consequently, when I begin a post, I generally do not consider it finished until it contains most of my thoughts on the subject, in an acceptable form and logic. (These posts can end up being 1500-2500 words.) If it doesn’t meet that standard, the entire post then goes into the purgatory file, never to be revisited again. Add in job demands, time management issues, and laziness, and I’ve got no blog posts to speak of! What I learned over time was that it’s okay to pre-edit or modify your post, and to not post your entire thought if it is not something that you feel you are expressing in a way that satisfies you. In other words, while I may still scrap many things, I can still post abbreviated versions of ideas that are begging to come out of me, without requiring that it be a treatise first. So, are shorter posts the answer to my blogging issues? Possibly, partially. Ultimately, I don’t know that the name of my blog really matters, or that what I wrote in the past matters either. This post is for Dischordant Forms, and we’ll see where it heads from there. Thanks for reading, and Happy New Year! Sorry I missed this when it came through, but glad you’re wanting to get back into it. You could always change the name and/or delete the old content. Or just move forward. Blogs can be kind of nice record of the ground you’ve covered in your thinking and writing. I started mine in 2010, I think, and it was three years before I ever started posting consistently. And it changed a lot in the next three. My early posts and my recent ones are like night and day. Whatever you do, best of luck! Thanks Walt! I appreciate the encouragement and advice. I don’t know that I am closer to knowing what I want to do here yet, but I think about it every day. There is a post that has been slowly forming in my mind recently – perhaps it will be my next. Where-/whenever it appears, I will be sure to let you know where to find it!